Calling all local entrepreneurs: if you have an idea for an authentic cultural experience or unique excursion to offer visitors to Bermuda in 2019, then this is the seminar for you. 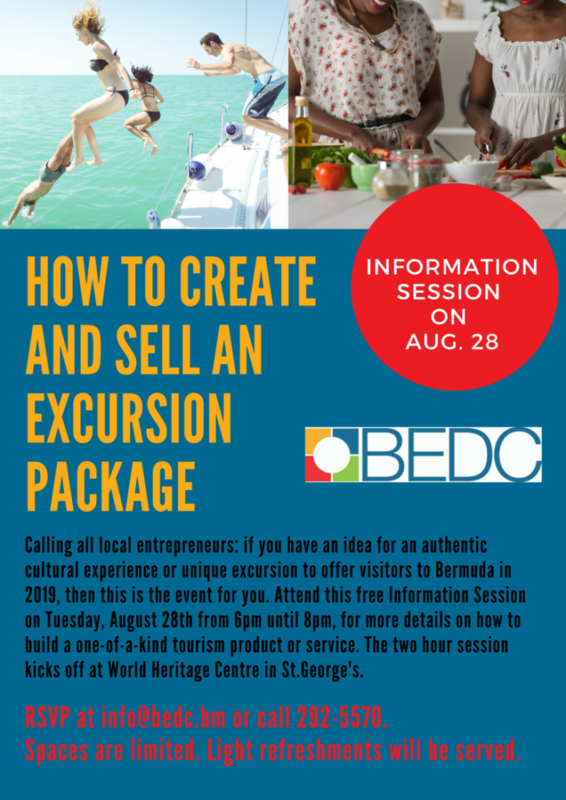 The Bermuda Economic Development Corporation (BEDC) is teaming up with industry stakeholders, to offer an interactive two hour event on ‘How To Create And Sell An Excursion Package’, taking place at the World Heritage Centre in St. George’s on Tuesday, August 28th from 6pm until 8pm. The free event aims to empower and equip people with tools to best seize new opportunities arising in the Island’s tourism sector. It also seeks to get entrepreneurs to start thinking creatively and proactively about what part they can play in the growing hospitality industry. Guest speaker will be BTA’s Hub One Tourism Manager Kristin White; also present will be local tour operators: Island Tour Centre, Winnow and Meyer Tours. Spaces are limited. To register your spot, call 292-5570 or e-mail info@bedc.bm.